Verdi did not feel the death of Alessandro Manzoni any less keenly because Manzoni was a very old man. It was a grievous blow. He had long had a reverence, almost amounting to idolatry, for the eminent Italian novelist and poet. He had admired him from a distance and, when a meeting was finally arranged, he was moved to the depths. ‘How shall I describe the extraordinary, indefinable sensation I felt in the presence of your “saint”?’, he wrote to Countess Clarina Maffei. ‘I would have gone down on my knees if one could worship men’. Earlier, he had tried to explain what it was he felt about him. Manzoni, he said, had written ‘not only the greatest book of our time but one of the greatest books that the human mind has produced [I Promessi Sposi (‘The Betrothed’)]. It’s not just a book, it’s a consolation to humanity. I was 16 when I first read it. Since then—if anything my experience of men has made me admire it all the more—because it’s a true book—Oh, if artists could but understand that “true”, there would be no more composers of the future or composers of the past, no puristic, realistic or idealistic painters, no poets classic or romantic, but true poets, true painters, true composers’. This was Verdi’s creed as an artist, and the Requiem Mass he wrote as a tribute to Manzoni and performed in 1874 on the first anniversary of his death is the fruit of it—whatever the critics’ subsequent attempts to reduce it to a category, labelled theatrical or operatic. The Requiem is true, before it is anything else. Verdi could only respond to the liturgy as the dramatist he was and by using the personal language he had evolved while composing a score of operas. But the sound-quality and texture and whole feel of the work is as unique and as different from La traviata or Don Carlos as they are from each other. And perhaps none of the works written before it had been so perfectly fashioned, so consistently strong in inspiration, so lofty in aim and achievement (even if the gaiety of the Sanctus may at first disconcert the non-Italian). 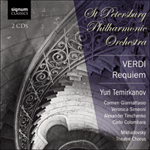 The Requiem used to be called ‘Verdi’s greatest opera’. Why not? As a sneer the remark is meaningless; as a splendid compliment it is not far short of the truth. What is the text of the ‘Dies irae’ if not operatic? The Requiem is certainly not religious in an orthodox way. Neither is Brahms’s, nor the Grande Messe des Morts. Even in Beethoven’s Missa Solemnis God is in a sense the projection, the creation of human fears and longings. Like Berlioz, Verdi was a humanist who retained a poignant regret for his childhood beliefs. But he had little use for the historical church (listen to the Grand Inquisitor’s scene in Don Carlos or the gloomy, brutish music that accompanies the procession of condemned heretics in the same work); and the criticisms that emanated from the Catholic hierarchy when Manzoni died did not dispose Verdi any more gently towards it. ‘Not a Catholic in the political and strictly theological sense of the word—nothing could be further from the truth’, was Boito’s verdict. As Verdi’s wife Giuseppina remarked, ‘the science, the sophisms, the metaphysical subtleties of the theologians and the learned of all the religions of all the ages strike vainly against the mystery of death’. It is too big a subject to be left to the clergy. Death and fear pervade the work. As someone who, in D’Annunzio’s phrase, ‘wept for all’, Verdi could express humanity’s feelings about it with ample authority. Hell, he knew, was something human beings can carry in themselves, and inflict on others. And death was in the air: Manzoni palpably a dying man some years before his long life ended in 1873, Rossini dead in 1868 (Verdi’s ‘Libera Me’ originated as a movement contributed to an abortive project for a mass in his honour), Verdi’s father dead, followed by his beloved father-in-law and benefactor Antonio Barezzi. The Requiem is, among other things, the passionate protest of a man who rebels against the outrage that is death. Boito experienced a similar feeling when he watched Verdi on his death-bed: ‘Never have I had such a feeling of hatred against death, of contempt for that mysterious, blind, stupid, triumphant and craven power—He too hated it, for he was the most powerful expression of life that it is possible to imagine’. Requiem and Kyrie: The opening is hushed, as muted cellos, then all the strings, play a slow, falling theme in A minor, against muttered pleas of ‘Requiem’, and the chorus continuing to intone sotto voce against the orchestra’s more expansive melodic line. At ‘Kyrie, eleison’ the soloists enter in turn, to an exalted theme which soars up over a chromatically descending bass, the music rising three times to climaxes of thrilling beauty. The end is again hushed, though a chord of F major strikes across the A major tonality like the sudden lifting of a curtain. Dies irae: ‘Dies irae’ is set as a single vast movement held together by its structure of keys and by the cataclysmic music of the opening, which recurs at intervals, its mood of terror pervading the intervening quieter sections. 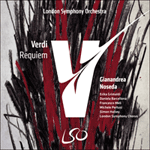 Verdi evokes the tumult of the Last Judgment by means of four thunderous chords, a jagged rising phrase, a wailing chant lurching backwards and forwards, giant bass-drum blows on the offbeat, precipitous woodwind scales, strings tremolando, uprushes of violins, and rapid rhythmic figures splayed out by the trumpets. The music dies down to a shudder of strings, fragmentary scales bubbling up on clarinets and bassoons, and awestruck repeated notes from the chorus. Then the air is thick with trumpets answering each other across the universe, and the crisis is upon us. Abruptly it breaks off and the solo bass, with bass drum, tells how Death and Nature itself shall stand amazed when the great Judge appears. ‘Liber scriptus’, a long, passionate solo for mezzo-soprano, wonderfully scored, follows—the choral interjections, descending chromatic phrases, and increasingly heavy, dragging rhythm, all showing that ‘Dies irae’ is gathering itself for a return, this time in shortened form. The succeeding verses are: ‘Quid sum miser’, a lovely, plaintive trio with desolate bassoon obbligato; ‘Rex tremendae’, alternating a majestic dotted theme for the basses with a wide-spanned phrase (‘salva me’), the two together building to a mighty climax; ‘Recordare’, a duet for soprano and mezzo in F major, with a repeated woodwind C, its rhythm taken from the preceding cries of ‘salva me’; ‘Ingemisco’, a lyrical tenor solo, with a moment of profound peace at ‘inter oves’, where the melodies’ anxious chromatic movement is stilled and the oboe plays an exquisite pastoral tune against divided tremolo violins; ‘Confutatis’, a bass solo of noble dignity and resignation, pleading for God’s mercy, and seeming to be about to cadence in E minor, but resolving onto G minor, the key of ‘Dies irae’, which now returns in all its fury and at full length, before settling into a dark and lamenting B flat minor, the key of the concluding ‘Lacrymosa’. This is built on a long theme of great breadth, with contrasting sections of lighter texture, but always returning to the desolate theme, each time more densely and darkly orchestrated. After a massive climax, the end is muted and melancholy. 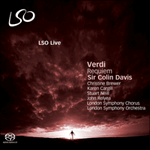 But just before it, by a juxtaposition of remote concords, Verdi strikes a note of hope, as ‘Amen’ is sung to a chord of G major, like a revelation; and the movement closes on repeated B flat major chords of immense solemnity and finality. Offertorium: Solo voices develop a calm, flowing theme stated by the cellos. The orchestration is warm and luminous. ‘Quam olim Abrahae’ is set in more vigorous style. It encloses a radiant ‘Hostias’, to a beautiful theme announced by the tenor, with accompaniment of tremolo strings. After the reprise of ‘Quam olim Abrahae’, there is a short restatement of the opening theme by all four voices in unison, then a shimmering orchestral epilogue, with the theme played three times very softly, each time differently harmonised. Sanctus: Trumpet fanfares, alternating with cries of ‘Sanctus’, introduce a fugue for double chorus, with brilliantly animated accompaniment. ‘Pleni sunt coeli’ is set to a smooth, serene version of the fugue subject, while the strings continue their vivacious chatter. Agnus Dei: Soprano and mezzo-soprano, in octaves, unfold a slow 13-bar theme. The whole movement, apart from the brief epilogue, is made up of repetitions of the theme (unvaried except for one minor-key version), first in unison, then harmonised in soft colours, with the calmly flowing counterpoint of three flutes prominent. The soloists are answered each time by the chorus, at first in full, later by the theme’s last six bars. Lux aeterna: A trio, for mezzo, tenor and bass—the soprano silent, in preparation for the final movement. Darkness and light here struggle for supremacy. The mezzo’s ‘Lux aeterna’ is in B flat major (with side-slips to D), against the bright sound of six-part tremolo violins, but answered by the bass with ‘Requiem aeternam’ on a sombre theme in B flat minor, punctuated by dark chords on low-lying bassoons, trombones and tuba. After a passage for the three voices alone, the bass theme returns; but out of it grows a wonderful melody, broad and lyrical and radiantly scored. Though the trombone chords are again heard, flutes and clarinets weave untroubled arpeggios above the voices, and the final mood is serene and hopeful. Libera me: That mood is abruptly dispelled, as the soprano’s recitative strikes a note of terrible urgency. The chorus murmur the prayer for salvation from everlasting death. Once again the soprano strikes in with ‘Dum veneris’ above an accompaniment that recalls the music of ‘Dies irae’. ‘Tremens factus’ follows, with the soprano gasping out broken phrases above a grey, restless texture of muted strings and low flutes. C minor comes to rest on a quiet E natural—followed without warning by the crashing G minor chords of ‘Dies irae’. This is given in full, finally modulating to B flat minor. Now comes one of the great moments of the work: the first movement’s ‘Requiem aeternam’ is repeated, this time by the voices alone, unaccompanied, intensified by the upward transposition of a semitone and crowned by the solo soprano’s soft, rapt B flat. But the peace so hardly won is shattered by a rasping tritone. The soprano repeats ‘Libera me’ with renewed energy, and the chorus break in with an agitated fugue. There is a transcendent moment when the soprano calms the tumult by singing the opening phrase of the fugue subject in long note-values, but the dread returns; the fugue works up to a devastating climax which leaves only a smoking ruin, a world destroyed by fire. In an atmosphere of abject supplication the soprano mutters the words on a single low note. The final two-fold ‘Libera me’—pp, then pppp (very soft, then even softer)—is a prayer as much for the living as for the dead. Tel était le Credo artistique de Verdi, et la Messe de requiem qu’il écrivit en hommage à Manzoni et fit exécuter en 1874 pour le premier anniversaire de sa mort en est le fruit—malgré les tentatives postérieures des critiques de le réduire à une catégorie, de l’étiqueter comme théâtral ou opératique. Le Requiem est vrai, avant toute autre chose. Verdi ne pouvait répondre à la liturgie qu’avec ses moyens d’homme de théâtre et en recourant au langage qu’il avait développé en composant les partitions de ses opéras. Mais le caractère sonore, la texture et l’atmosphère générale de cette œuvre sont aussi uniques et différentes de La Traviata ou Don Carlos que ces deux ouvrages le sont l’un de l’autre. Et peut-être aucune de ses partitions antérieures n’avait été façonnée avec une telle perfection, avec une inspiration aussi consistante et puissante, avec autant de noblesse dans le dessein et dans la réalisation (même si la gaieté du Sanctus peut, au premier abord, déconcerter un non Italien). On a souvent parlé du Requiem comme du «plus bel opéra de Verdi». Pourquoi pas? S’il s’agit d’une raillerie, cette expression est dépourvue de sens; mais, si c’est un superbe compliment, elle n’est pas si éloignée de la vérité. Qu’est donc le texte du «Dies irae» sinon de l’opéra? Le Requiem n’est certainement pas religieux au sens orthodoxe du terme. Mais le Requiem allemand de Brahms ne l’est pas davantage, ni la Grande Messe des morts de Berlioz. Même dans la Missa Solemnis de Beethoven, Dieu est d’une certaine manière la projection, la création des peurs et des désirs humains. Comme Berlioz, Verdi était un humaniste et conservait le regret poignant de ses croyances d’enfant. Mais il n’avait pas un grand besoin de l’Eglise historique (écoutez la scène du Grand Inquisiteur dans Don Carlos ou la musique sombre, bestiale qui accompagne la procession des hérétiques condamnés dans le même ouvrage); et les critiques qui émanèrent de la hiérarchie catholique à la mort de Manzoni ne disposaient pas Verdi à leur témoigner une quelconque bienveillance. Boito émit ce verdict: «Pas un catholique dans le sens politique et strictement théologique du terme—rien n’aurait pu être plus loin de la vérité.» Comme le remarqua l’épouse de Verdi, Giuseppina, «la science, les sophismes, les subtilités métaphysiques des théologiens et le savoir de toutes les religions de toutes les époques combattaient vainement contre le mystère de la mort». C’est une question trop importante pour qu’on la laisse au clergé. Requiem et Kyrie: L’œuvre s’ouvre dans un murmure: les violoncelles avec sourdine, puis toutes les cordes, jouent un thème lent et descendant en la mineur auquel répondent les appels chuchotés sur «Requiem», et le chœur continue à chanter sotto voce conjointement à la ligne mélodique plus expansive de l’orchestre. Aux mots «Kyrie, eleison», les solistes entrent tour à tour, sur un thème exalté qui surgit au-dessus d’une basse descendant chromatiquement, la musique s’élevant par trois fois jusqu’à des sommets à la beauté saisissante. On retourne finalement au murmure, même si un accord de fa majeur vient zébrer la tonalité de la majeur, comme si l’on levait soudain le rideau. Dies irae: Le «Dies irae» est mis en musique sous la forme d’un vaste et unique mouvement, don’t la cohérence est assurée par la structure tonale et par la musique cataclysmique du début, qui revient régulièrement et don’t le climat de terreur imprègne les sections plus calmes qu’elle entoure. Verdi évoque le tumulte du Jugement dernier au moyen de quatre accords tonitruants, d’une phrase ascendante aux contours hachés, d’un chant gémissant qui tangue d’avant en arrière, de coups de grosse caisse explosifs et à contretemps, de gammes de bois abruptes, de trémolos de cordes, d’assauts de violons et de figures rythmiques rapides lancées par les trompettes. La musique s’éteint sur un frissonnement de cordes, de bribes de gammes montant comme des bulles aux clarinettes et aux bassons, et de notes répétées par le chœur saisi d’effroi. Puis l’atmosphère est envahie par les trompettes qui se répondent d’un bout à l’autre de l’univers, et c’est le cataclysme. Il éclate brutalement, et la basse solo, de concert avec la grosse caisse, nous raconte comment la Mort et la Nature elles-mêmes resteront stupéfaites lorsque apparaîtra le Juge suprême. Le «Liber scriptus» fait suite, un solo de mezzo-soprano long et passionné, magnifiquement orchestré. Les interjections chorales, les phrases descendantes chromatiques et le rythme de plus en plus pesant, traînant, tout indique que le «Dies irae» est en train de rassembler ses forces pour son retour, cette fois sous une forme écourtée. Les versets suivants forment le «Quid sum miser», un trio beau et plaintif avec l’accompagnement désolé d’un basson obligé. Le «Rex tremendae» fait alterner un majestueux thème de contrebasses en rythmes pointés avec une ample phrase («Salva me»), qui s’unissent pour former un puissant sommet d’intensité. Le «Recordare», un duo pour soprano et mezzo en fa majeur, avec des do répétés aux bois, tire son rythme des invocations précédentes sur «Salva me». L’«Ingemisco» est un solo lyrique confié au ténor; il atteint un moment de paix profonde sur «inter oves», où le mouvement chromatique anxieux des mélodies s’apaise et où le hautbois joue un air pastoral exquis sur les trémolos des violons divisés. Le «Confutatis», un solo de basse à la noblesse digne et résignée, implorant la grâce divine, semble se diriger vers une cadence en mi mineur; mais il se résout finalement en sol mineur, la tonalité du «Dies irae», qui revient à présent dans toute sa furie et dans son entièreté avant de se fixer sur la tonalité sombre et plaintive de si bémol mineur, celle du «Lacrymosa» final. Ce morceau est construit sur un thème long et ample, avec des sections contrastantes à la texture plus légère, mais retournant toujours au thème désolé, orchestré à chaque reprise d’une manière plus dense et sombre. Après un sommet massif, la fin est feutrée et mélancolique. Mais, juste auparavant, par la juxtaposition d’harmonies lointaines, Verdi apporte une note d’espoir, quand l’«Amen» est chanté sur un accord de sol majeur, comme une révélation; et le mouvement se referme sur des accords de si bémol majeur à la solennité et la détermination impressionnantes. Offertoire: Les voix solistes déploient un thème calme et fluide, présenté par les violoncelles. L’orchestration est chaude et lumineuse. «Quam olim Abrahae» est illustré dans un style plus vigoureux. Ce mouvement recèle un lumineux «Hostias», sur un thème magnifique entonné par le ténor, avec un accompagnement des cordes en trémolos. Après la reprise de «Quam olim Abrahae», le thème initial est brièvement réexposé par les quatre voix à l’unisson, puis vient un épilogue orchestral chatoyant, où le thème est joué trois fois très doucement, chaque fois avec une harmonisation différente. Sanctus: Des fanfares de trompettes, alternant avec les acclamations «Sanctus», introduisent une fugue pour double chœur, avec un accompagnement vif et brillant. «Pleni sunt coeli» est illustré par une version suave, sereine du sujet de fugue, tandis que les cordes poursuivent leur bavardage plein de vivacité. Agnus Dei: Soprano et mezzo-soprano, à l’octave, déploient un thème lent de treize mesures. Tout le mouvement, à l’exception du bref épilogue, consiste en répétitions du thème (non varié, hormis une version en mineur), d’abord à l’unisson, puis harmonisé avec des couleurs douces, où dominent le contrepoint calme et fluide de trois flûtes. A chaque fois, le chœur répond aux solistes, tout d’abord sur le thème intégral, puis sur ses six dernières mesures. Lux aeterna: Le «Lux aeterna» est un trio, pour mezzo, ténor et basse—la soprano se tait, en préparation du mouvement final. L’ombre et la lumière combattent pour leur suprématie. Sur «Lux aeterna», la mezzo chante en si bémol majeur (avec des emprunts à ré), accompagnée par les sonorités lumineuses de trémolos de violons à six voix; mais la basse lui répond, sur «Requiem aeternam», par un thème sombre en si bémol mineur, ponctué d’accords sombres eux aussi dans le grave des bassons, trombones et tuba. Après un passage des trois voix a cappella, le thème de la basse revient; mais il en émerge une mélodie merveilleuse, ample et lyrique, orchestrée de manière radieuse. Bien que l’on entende à nouveau les accords de trombones, les flûtes et les clarinettes tissent des arpèges paisibles au-dessus des voix, et le morceau se termine dans un climat de sérénité et d’espérance. Libera me: Cette atmosphère s’évanouit brutalement à l’entrée de la soprano, don’t le récitatif instaure un climat d’urgence terrible. Le chœur murmure une prière, pour être libéré de la mort éternelle. La soprano fait de nouveau irruption aux mots «Dum veneris», sur un accompagnement rappelant la musique du «Dies irae». Dans le «Tremens factus» qui vient ensuite, elle chante en haletant des phrases déchiquetées, sur un tapis grisâtre et inquiet de cordes avec sourdines et de flûtes dans le grave. La tonalité d’ut mineur trouve le repos sur un mi naturel paisible, mais le charme est brutalement rompu par les accords fracassants du «Dies irae», en sol mineur. Cette section est reprise dans son intégralité, modulant dans ses dernières mesures en si bémol mineur. Survient alors un des moments les plus extraordinaires de l’œuvre: on réentend le «Requiem aeternam» qui ouvrait la partition, mais cette fois aux voix seules, sans accompagnement, intensifié par une transposition au demi-ton supérieur et couronné par le si bémol recueilli et tout en douceur de la soprano. Mais la paix acquise si difficilement est obscurcie par un âpre triton. La soprano répète «Libera me» avec une énergie renouvelée, et le chœur se lance dans une fugue agitée. On arrive à un nouveau moment de grâce lorsque la soprano calme le tumulte en chantant la première phrase du sujet de fugue en valeurs longues, mais l’effroi revient; la fugue monte en puissance jusqu’à un sommet dévastateur qui ne laisse derrière lui que des ruines fumantes, un monde détruit par les flammes. Dans un climat de supplication abjecte, la soprano marmonne les paroles sur une unique note grave. Le «Libera me» final, énoncé deux fois—pp, puis pppp (très doux, puis encore plus doux)—est une prière autant pour les vivants que pour les morts. Das war Verdis künstlerisches Credo, und das Requiem, welches er zu Ehren von Manzoni schrieb und 1874 zum ersten Jahrestag seines Todes aufführte, ist dafür ein Beispiel—ungeachtet der späteren Versuche von Rezensenten, das Requiem in eine Schublade mit der Aufschrift Musiktheater oder Oper zu zwängen. Das Requiem ist wahr, bevor es irgendetwas anderes ist. Verdi konnte auf die Liturgie nur als der Bühnenmensch reagieren, der er war, und das mit der persönlichen Sprache, die sich beim Komponieren zahlreicher Opern herausgebildet hatte. Doch ist die Klangqualität und Textur und der gesamte Eindruck des Werkes unverwechselbar, das Requiem hat genauso wenig mit La traviata oder Don Carlos gemein wie jene untereinander. Vielleicht war keines der zuvor geschriebenen Werke so perfekt gearbeitet, so durchgehend einfallsreich, so thematisch und philosophisch ehrgeizig (selbst wenn die Fröhlichkeit im Sanctus einen nicht aus Italien Stammenden vorerst verunsichern mag). Man pflegte das Requiem als „Verdis größte Oper“ zu bezeichnen. Warum nicht? Als Spott greift die Bemerkung nicht, als ein herrliches Kompliment kommt sie der Wahrheit sehr nahe. Was ist der Text des „Dies irae“ wenn nicht opernhaft? Das Requiem ist sicherlich nicht im konventionellen Sinne religiös. Aber das ist auch Brahms’ Requiem nicht oder Berlioz’ Grande messe des morts. Selbst in Beethovens Missa solemnis ist Gott auf gewisse Weise die Projektion, die Schöpfung menschlicher Ängste und Sehnsüchte. Wie Berlioz war Verdi ein Humanist, der den Verlust seines Kinderglaubens ein Leben lang herzlich bedauerte. Aber er konnte mit der traditionellen Kirche wenig anfangen (hören Sie sich nur die Szene des Großinquisitors aus Don Carlos an oder die düstere, brutale Musik, die den Zug verdammter Ketzer im gleichen Werk begleitet). Kein Wunder, dass die aus den katholischen Reihen aufsteigende Kritik nach dem Tode Manzonis Verdi gegenüber nicht positiver eingestellt war. „Kein Katholik im politischen oder streng theologischen Sinne des Wortes—nichts könnte falscher sein“, war Boitos Urteil. Wie Verdis Frau Giuseppina bemerkte: „ … die Wissenschaft, der Sophismus, die metaphysischen Spitzfindigkeiten der Theologen und Gelehrten aus allen Religionen aller Zeiten kämpfen umsonst gegen das Mysterium des Todes.“ Das Thema ist zu groß, als dass man es den Geistlichen überlassen sollte. Requiem und Kyrie: Der Anfang ist leise, wenn die gedämpften Violoncelli, dann alle Streicher ein langsames, absteigendes Thema in a-Moll in Begleitung murmelnder Bitten um „Requiem“ spielen und der Chor dann auf dem Hintergrund der weiter ausholenden melodischen Linien des Orchesters sotto voce weitersingt. Auf die Worte „Kyrie eleison“ setzen die Solisten nacheinander mit einem lebendigen Thema ein, das sich über einem chromatisch absteigenden Bass aufschwingt. Die Musik erreicht dabei drei Höhepunkte von aufregender Schönheit. Das Ende ist wieder gedämpft, auch wenn ein unerwarteter F-Dur-Akkord in der A-Dur-Tonart die Wirkung eines plötzlich öffnenden Vorhangs hervorruft. Dies irae: „Dies irae“ wurde zu einem einzigen riesigen Satz vertont, der durch seine Tonartenstruktur und die kataklystische Musik des Anfangs zusammengehalten wird, die in Abständen wieder zurückkehrt und deren Gefühl des Terrors sich auch durch die dazwischenliegenden ruhigeren Abschnitte zieht. Verdi bildet die Aufregung des Jüngsten Gerichts vermittels vier donnernder Akkorde ab, einer schroffen aufsteigenden Geste, einer klagenden, vor- und zurück schwankenden Melodie, Detonationen der riesen Basstrommel gegen den Grundschlag, steiler Holzbläserläufe, Streichertremoli, auffahrender Violinen und rapider rhythmischer Figuren, die von den Trompeten hervorgeschmettert werden. Die Musik flaut zu einem Zittern der Streicher, fragmentarischen, auf Klarinetten und Fagotten blubbernden Läufen und ehrfürchtigen Tonwiederholungen des Chores ab. Dann herrscht dicke Luft, wenn Trompeten über das Universum hinweg aufeinander antworten, und die Krise steht vor der Tür. Plötzlich erfolgt ein Abbruch und der Solobassist erzählt von der Basstrommel begleitet, wie selbst Tod und Natur vor Erstaunen erstarren werden, wenn der große Richter erscheint. Darauf folgt das „Liber scriptus“, ein langes, leidenschaftliches Solo für Mezzosopran, wunderbar orchestriert—die Einwürfe des Chores, absteigende chromatische Gesten und zunehmend schwere, schleppende Rhythmen lassen erkennen, dass sich das „Dies irae“ auf eine Rückkehr vorbereitet. Wenn es dann tatsächlich einbricht, erklingt es in gekürzter Form. Die darauf folgenden Abschnitte sind: „Quid sum miser”, ein reizendes, wehmütiges Trio mit untröstlichem, obligatem Fagott; „Rex tremendae“, ein Abschnitt, in dem sich ein majestätisch punktiertes Thema für Kontrabässe mit einer weit ausschweifenden Geste („salva me“) abwechselt und beide musikalische Gedanken zusammen einen mächtigen Höhepunkt ansteuern; „Recordare“, ein Duett für Sopran und Mezzosopran in F-Dur mit einem wiederholten C in den Holzbläsern, wobei der Rhythmus der Tonwiederholung aus den vorangegangenen Rufen „salve me“ abgeleitet wurde; „Ingemisco“, ein lyrisches Tenorsolo mit einem Moment ernsten Friedens auf „inter oves“, wo die ängstliche chromatische Bewegung der Melodien eine Beruhigung erfährt und die Oboe eine köstliche pastorale Melodie gegen Tremoli geteilter Violinen vorträgt; „Confutatis“, ein Basssolo voll nobler Würde und Resignation, das Gott um Gnade bittet und sich anschickt, nach e-Moll zu kadenzieren, dann aber in g-Moll eine Auflösung erfährt, der Tonart des „Dies irae“, das jetzt mit seiner ganzen Wucht und in voller Länge zurückkehrt, bis es sich auf ein dunkles, klagendes B-Moll einpegelt, der Tonart des abschließenden „Lacrymosa“. Das nimmt seinen Ausgangspunkt in einem langen, weitschweifigen Thema, enthält kontrastierende Abschnitte mit leichteren Texturen, kehrt aber immer wieder zu jenem desolaten Thema zurück, jedes Mal dichter und dunkler orchestriert. Nach einem massiven Höhepunkt folgt das Ende gedämpft und melancholisch. Doch noch kurz davor stimmt Verdi durch eine Nebeneinanderstellung weit verwandter Tonarten einen Ton der Hoffnung an, wenn nämlich das „Amen“ wie eine Offenbarung auf einem G-Dur- Akkord gesungen wird. Dann schließt der Satz auf wiederholten, immens feierlichen und endgültigen B-Dur-Akkorden. Offertorium: Gesangsolisten entwickeln ein ruhiges und fließendes, von den Celli vorgestelltes Thema. Die Orchestrierung ist warm und leuchtend. „Quam olim Abrahae” wurde in einem lebhafteren Stil vertont. Dieser Abschnitt umschließt ein strahlendes „Hostias”, das ein wunderschönes, vom Tenor eingeführtes und von Streichertremoli begleitetes Thema enthält. Nach der Wiederholung des „Quam olim Abrahae” gibt es eine kurze Reprise des Anfangsthemas von allen vier Solisten im Unisono, dann einen schimmernden Orchesterepilog, in dem das Thema dreimal sehr leise erklingt, jedes Mal anders harmonisiert. Sanctus: Die mit Rufen des „Sanctus“ alternierenden Trompetenfanfaren leiten eine Fuge für Doppelchor mit schillernd lebhafter Begleitung ein. „Pleni sunt coeli“ erklingt auf eine geschmeidige, gelassene Fassung des Fugenthemas, während die Streicher ihr munteres Geschnatter fortsetzen. Agnus Dei: Sopran und Mezzosopran entfalten in Oktaven ein langsames 13-taktiges Thema. Außer dem kurzen Epilog besteht der ganze Satz aus Wiederholungen dieses Themas (unverändert mit Ausnahme einer Mollvariante), zuerst im Unisono, dann in weichen Farben harmonisiert, wobei der ruhig fließende Kontrapunkt der drei Flöten zum Vorschein tritt. Jedes Mal reagiert der Chor auf die Solisten, zuerst vollständig, dann mit den letzten sechs Thementakten. Lux aeterna: Ein Trio für Mezzosopran, Tenor und Bass—die Sopranistin schweigt in Vorbereitung auf den abschließenden Satz. Dunkelheit und Licht kämpfen hier gegeneinander um Vorherrschaft. Das „Lux aeterna“ der Mezzosopranistin erklingt in B-Dur (mit Abschweifungen nach D-Dur) auf dem leuchtenden Klanghintergrund aus in sechs Stimmen geteilter, tremolierender Violinen, wird aber vom Bassisten mit einem düsteren Thema in b-Moll auf „Requiem aeterna“ beantwortet, das von dunklen Akkorden tiefer Fagotte, Posaunen und der Tuba durchsetzt ist. Nach einer Passage für die drei Solosänger allein kehrt das Bassthema wieder zurück, aber daraus erwächst eine wunderbare Melodie, breit und lyrisch und strahlend orchestriert. Zwar hört man erneut die Posaunenakkorde, doch weben Flöten und Klarinetten unbekümmerte Arpeggios durch die Stimmen, und die abschließende Stimmung ist gelassen und hoffnungsvoll. Libera me: Diese Stimmung schlägt abrupt um, als das Rezitativ der Sopranistin einen Ton schrecklicher Dringlichkeit anschlägt. Der Chor murmelt das Gebet zur Errettung vom ewigen Tod. Wiederum bricht die Sopranistin ein, mit „Dum veneris“, über einer Begleitung, die die Musik des „Dies irae“ in Erinnerung ruft. Darauf folgt „Tremens factus“, wo die Sopranistin gebrochene musikalische Phrasen über einer grauen, ruhelosen Textur aus gedämpften Streichern und tiefen Flöten keucht. C-Moll beruhigt sich auf einem leisen aufgelösten E—ohne Warnung gefolgt von den schmetternden G-Moll-Akkorden des „Dies irae”. Das wird vollständig wiederholt und moduliert am Ende nach b-Moll. Nun kommt einer der großartigen Momente des Werkes: Das „Requiem aeternam“ aus dem ersten Satz wird wiederholt, diesmal von den Gesangssolisten allein, unbegleitet, durch die Transposition einen Halbton nach oben intensiviert und von dem weichen, seligen B der Solosopranistin gekrönt. Aber der so hart erkämpfte Frieden wird von einem kratzenden Tritonus erschüttert. Die Sopranistin wiederholt „Libera me“ mit erneuter Energie, und der Chor bricht mit einer erregten Fuge ein. Es gibt einen transzendenten Moment, wenn die Sopranistin die Aufregung durch das Singen der Anfangstakte aus dem Fugenthema in langen Notenwerten schlichtet, aber die Furcht kehrt zurück. Sie steuert einen überwältigenden Höhepunkt an, der nur eine rauchende Ruine hinterlässt, eine vom Feuer zerstörte Welt. In einem Zustand tiefster Demut murmelt die Sopranistin die Worte auf einer einzigen tiefen Note. Das abschließende zweifache „Libera me” – pp dann pppp (sehr leise, dann noch leiser)—ist in gleichen Maßen eine Gebet für die Lebenden wie für die Toten. and to Thee shall be paid a vow in Jerusalem. to Thee all flesh shall come. he who shall examine all things strictly. Dum vix iustus sit sicurus? let not such a burden have been in vain. that I be not burned in the everlasting fire. that they may not fall into darkness. pass from death into life. grant unto them rest eternal. to judge the world with fire.